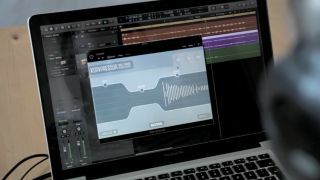 Klevgränd has released several effects as both desktop plugins and iOS apps. "Ideally, every UI should be dynamically resizable, but this usually means more effort on the part of GUI designers and might tax the CPU and GPU more in the case of vectorised UIs. Then there's the balance between an attractive UI and something that scales to every display. I don't think all the developers will uniformly agree on how to handle this; it would, however, be a tragedy if all UIs ended up looking similar." "We've historically had a fixed UI size for our plugins, but we're receiving more and more requests from people using big displays to make them bigger and more readable. We're working on a solution that should fit any kind of display. "For tablet apps, this is another topic - you have to think of the interface in a radically different way. People aren't working with an iPad in the same way that they're working with their laptop. We use bigger buttons, take advantage of the multitouch functionality and so on." "When developing audio software, you generally have an idea of the type of display it'll be used on, whether that be a smartphone, tablet or desktop monitor. Fortunately, cross-platform application frameworks such as JUCE make the targeting of these different platforms relatively painless. True dynamic plugin window sizing would be ideal, though for several reasons this is quite a challenge to implement effectively in an audio plugin. Instead, we're seeing a shift towards the offering of static small/regular/large interface sizing options - this is a feature we have in the works for Circle²." "Designing multiple user interfaces to support different resolutions is a real challenge. We chose to build our own framework and design different user interfaces easily with own interface editor. This saves the layout data as XML, which is loaded dynamically at runtime. SynthMaster, SynthMaster CM and SynthMaster Player are all designed with it. We're hoping to extend our framework to iOS and Android as well." "The good thing about a bitmap-based GUI is that you can have a unique photorealistic look. In the last few years, most developers tried to create a 'looks-like-hardware' design with rendered 3D/2D elements. But indeed, scalability is always a problem with bitmaps. And, which makes it even worse, a lot of users are working with high screen resolutions, causing some bitmaps to look tiny. So, I think that vector and fractal-based GUIs will be the best solution to address the diversity of screen resolutions. Furthermore, a user-controllable modular GUI design and/or automatic arrangement of GUI assets according to zoom settings would help a lot."